Are you in a hurry to get a credential that will help you start a new career, advance in your current career, or help you transfer to a 4-year college or university? Online community college degree programs are a handy, flexible way to do it. But just how long will it take to get your degree online? The first question is what kind of degree you’re working toward. Community colleges generally offer certificates, diplomas, and associate’s degrees. 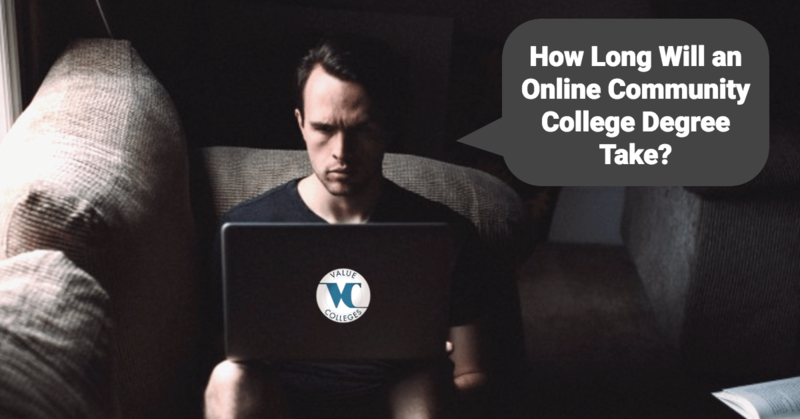 Not sure where to start when choosing an online community college? Check out our Top 50 ranking of Online Community Colleges in the United States. Certificate programs typically take a few weeks or months to complete. Certificates are usually awarded for a particular set of courses that are highly focused on one particular skill or career. An HVAC certificate program, for instance, gives students the basics in working as an HVAC technician. Common certificates are in trades (like electrician), computers (such as a specific programming language), or health (like phlebotomy). They certify that someone is capable of doing a specific job, but are generally only good for an entry-level position. Diploma programs are usually designated as one-year programs, because that is the amount of time it would take on a conventional, full-time schedule. A diploma is also specific, and goes into more depth than a certificate, but it does not have the general liberal education courses that a degree would include. An RN diploma, for instance, is enough credential to take the NCLEX exam to earn a registered nursing license, taking only courses related to nursing (and not, for instance, English or Math). Associate’s Degree programs are the equivalent of the first two years of a four-year college degree. Unlike the diploma, an associate’s degree includes all of the foundational humanities and science courses that a college student takes, along with the basic major courses. An Associate of Arts or Associate of Science are the most common, though Associate of Applied Science is often offered as an entry to technology fields like engineering. And then, of course, real life happens. Those are the expected rates for full-time students; if your schedule will only allow you to to devote part-time (less than 12 credits a semester), then your time frame will stretch; it will take longer, because you can’t do as many courses at the time. If something comes up to delay or derail your education, you might lose as much as a semester or a year. A two-year degree becomes three or four. Online courses can be a bit hazardous in this way. The Community College Resource Center (CCRC) finds that students are much more likely to drop out of online courses than on-campus courses, an average of 5.5% more – and more than 12% in particularly demanding courses like writing or math. Well-prepared, experienced students usually do better than new students, but in general, it is easier to give up on a class when you don’t see your professor or classmates. So the bottom line is, how long your degree will take is up to you. According to the CCRC, 29% of community college students finish their degree within 3 years, but that figure doesn’t take into account students who transfer to a 4-year college or university and complete their bachelor’s degree – 55% of those students complete a bachelor’s within 6 years. One of the biggest advantages of the community college system is how flexible it is; it allows you to make the decisions that are best for you, and if your schedule won’t allow you to finish your associate’s degree in two years, you’re not penalized. When life gets in the way, community college will still be there ready for you.